Little Miss Violet is a growing girl. Some mornings she seems noticeably taller like she grew a few inches in her sleep. She's been MC Too Tight for a while now. That's what I call her when she's wearing the 3/4 length sleeves and capri pants look. It's getting too cold for that! Time to pass on her too small clothes and add to her winter fashion closet. I began my search online with Cookie's Kids. They have 7 brick & mortar stores in Jamaica, Queens, Bronx and Brooklyn in New York as well as an online store. As you can probably guess, I went to CookiesKids.com to look around. Right away I noticed the large selection of fashion brands I've heard of like Baby Phat clothing and North Face backpacks. They also have school uniforms and toys. I was surprised to find such a large selection for V's age. I thought it would be mostly school aged kids clothes. First and foremost, I looked for a coat. She has one coat that is too big and one that is too small. She needed one that she could wear now. Using the Alva kids icon next to the coat I chose, I was able to plug in a few details about V and get her the size that would fit her best which happened to be 3T. The coat she's been wearing is 18 months! Here's V in her brand new coat and her pet bunny! I think she likes it. She needed long sleeve tops so I searched through what was available in her size. I ended up purchasing a couple of tees -- a fuchsia crewneck and a graphic one with pockets! Both were under $5. Before I left, I looked through the clearance section because that's just how I roll. 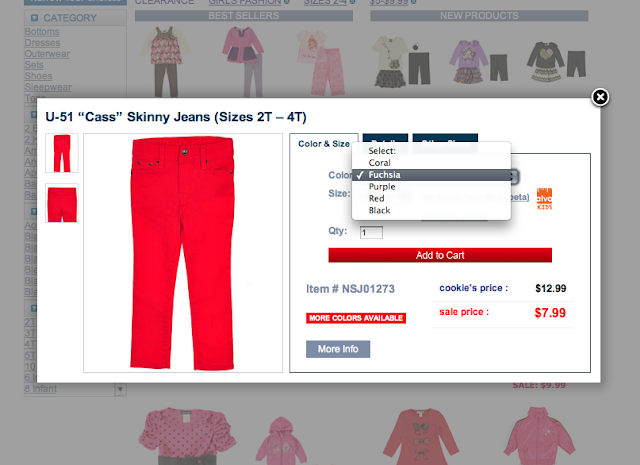 While searching through clearance I spotted colored jeans available in 5 colors! I wanted to buy one of each but I'm trying to break the habit of buying multiples of the same item. I bought the fuchsia color to match her new tee. They're the perfect length thanks to the Alva kids icon. 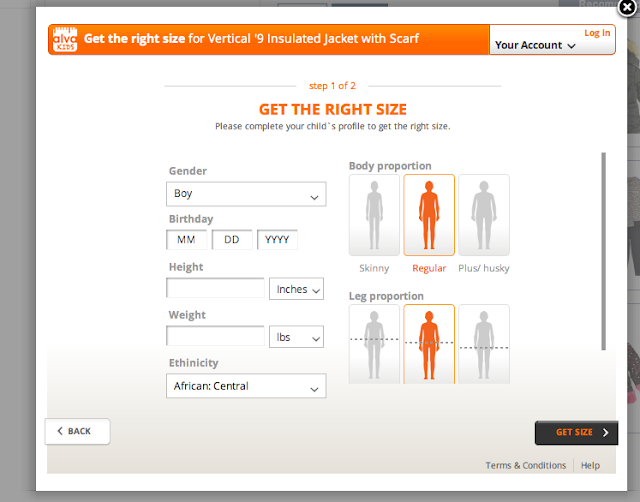 I spent a total of $37.91 and was able to purchase a winter coat, two tops and a bottom including the cost of shipping. Not too bad. It's not thrift store prices but pretty comparable and everything is fresh, new and on trend for the mini fashionista! What do you think? Do you like V's new style? Visit my Google+ album to see more pics from this shop and V hamming it up for the camera. Are you wondering who Cookie is? Cookie is the man who started the business with his brother Marvin 40 years ago in Jamaica, Queens. To find out more about the history of #CookiesKids and keep up with sales and special deals, visit them on Twitter or Facebook. Wow I remember Cookies! I lived in Queens for over 20 years and this is where I shopped for my kids way back when. It's nice to see they're still around and on trend. I loved Cookies! V's pieces are super adorable and you got great prices. She's a cutie pie. 3) Very stylish!! A fashionista in the making!! 4) Great choice of outfits! Adorable! Love the purple jacket. Purple is my daughter's favorite color so we completely agree with the styles you chose. I always love to hit Cookie's Kids clearance and sale items. Always great deals there to find. I will check this site out. Thanks for the tip. oh, she is such a doll baby! MC Too Tight though?? Too funny! The new clothes are super cute and I'm loving the prices. I'll be checking them out! Wow, what an awesome fashionista she is! She looks adorable, especially in the picture of her wearing the light purple shirt with the pockets. Love it! Loving her style and look! You know I love her hair! ;) Go 'head, Lil lady! I see Little Miss V has been taking some pointers from here mama! You may have to give her a post or two more often! I want her shoes by the way! V is so lovely. We measure our little one by marking his height on the door. It's amazing to see how they grow by leaps!